The author and her BFF: Hill-top coffee stop, Alaska Range. Valdez 2013: my first fly-in. The weather across the state of Alaska was uniformly amazing, and there were an exceptional number of airplanes in attendance. The GPS line from Talkeetna involved crossing two mountain ranges, several large glaciers, and the jagged fjords of Prince William Sound. My merciless wingmen soon left me, the underpowered Pacer, far behind. I tried not to think too hard about the ocean beneath my tundra tires. Small beaches popped from the landscape with extra importance. Any Kodiak pilot would feel right at home, but we inland pilots are afraid of water. We settled into a posse near the north end of the ramp. My 10-month-old daughter crawled around, hoisting herself upright on the gear legs as I set up camp. The sea of assembled airplanes glittered in the sun. Carbon Cubs, shiny Cessna 185s, and strange experimentals that were probably worth five years of my air taxi pilot salary. And that’s when I realized they were all nicer than mine. Most of my aviation career has taken place in the Shangri-La that is Talkeetna, Alaska. It is an aviation town through and through, with a thriving little airport and a warm flying culture. No one has much money, and the airplanes reflect that. 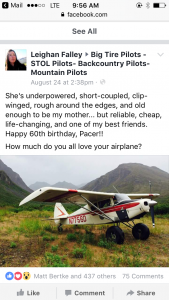 It is not uncommon for an airplane owner to lack running water in their small, off-the-grid cabin. 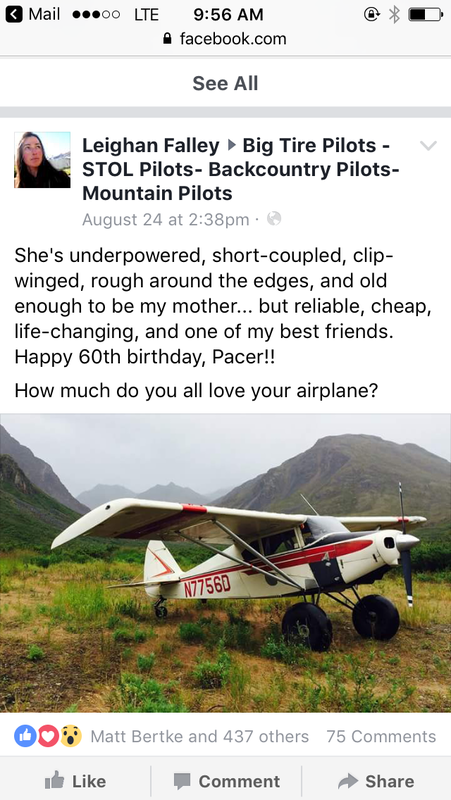 My PA–22/20 is totally airworthy, but pretty rough looking. With its clipped wings and small motor, it made a pretty spicy bush plane. But I was in love from the day I’d bought it, and had failed to notice the flaws. Plus, it was all I could afford. I truly think that some airplanes are blessed with, you know, that flying spirit. This thing surely has it. It has nine lives, and we’ve been through a lot together. We are bonded. Quite a few people agreed with my post. Soon enough, people began strolling up and down the lines of parked airplanes. Never having been to a fly-in, I was bewildered. It felt exactly like the cat shows I’d participated in as a nerdy teenager. Here you sit, by your animal, and the humans file past… and comment on it. Everyone had something to say about my plane. And it wasn’t good. After the poor guy left, I sat down in a huff against my tundra tire. The smell of my daughters poopy diaper wafted across our campsite. I had stepped foot outside my aviation nursery and it wasn’t exactly good. Back in Talkeetna, no one questioned me or my airplane. They watched us come and go, working our way through the trials of the off-airport… and always coming back intact. 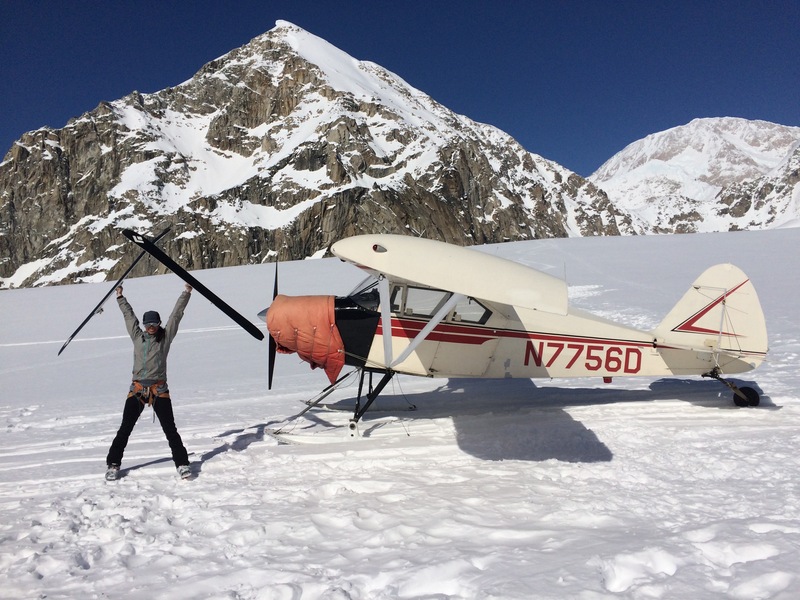 Denali Basecamp, April 2018 ski-mountaineering day trip. 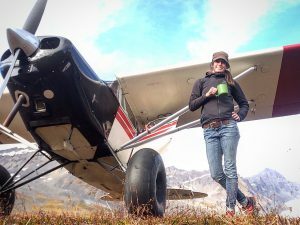 I’d laid tracks with a Talkeetna Air Taxi Beaver the previous day dropping off some of the first climbers prior to the actual installment of camp. Conditions were so good that even the lowly Pacer did just fine. Photo by my climbing partner and National Park Service climbing ranger Melis Coady.